Are you ready for the Medicare number change? This podcast will help you to prepare your staff and your patients. 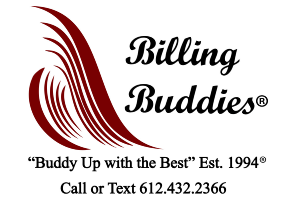 Billing Buddies strives to help healthcare providers in billing and compliancy issues. Our hope is the healthcare providers will pass their knowledge to coworkers and patients. If you have any questions, please feel free to call or text the author, Bonnie at 612.432.2366. Thank you. Approach: Keep your patients informed of the change to come with their Medicare policy numbers and cards.Â Be prepared to start collecting new cards and identification from your patients. Why are you sending medical records for free? There is a Federal Rule allowing you to charge. Find out the details in our video. Centers for Medicare and Medicaid Services (CMS) has released a New Advance Beneficiary Notice (ABN) in March 2017. It's to be effective June 21, 2017. Listen and learn more about the purpose of the form and how to complete it. This podcast reviews how to handle billing if a liability insurance denies. This podcast reviews the Medicare LCD guidelines for chiropractic billing. If you need assistance, we offer private coaching for $199. Please text or call Bonnie at 612.432.2366. This podcast discusses the history of the OIG Compliance Plan and how to become compliant. Do you perform a checks and balance at the end of the day for your charges and payments? This podcast tells you how. This podcast explains to clinics the difference between patient balances, contract insurance balances and non-contract insurances and how to bill each bucket appropriately.